In their quirky filmmaking, Joel and Ethan Coen have given us moments both inspired and mediocre. Since daring to fail and eccentricity go hand in hand, their fans are prepared to soak up the inspiration and tolerate the missteps. The Coens may have enjoyed making Hail Caesar! more than you will enjoy watching it. That will depend on your own degree of peculiarity. They have created a mockery of Hollywood’s Golden Age when studio bosses had immense power over anyone who worked for them. Those movie moguls controlled the details of the lives of the biggest stars and trapped them in contracts that eliminated personal choice. Audiences in that grand post WWII time knew that almost any movie they saw would be punctured by a full stop that would immediately be filled by some sort of musical event entirely unrelated to the movie itself. Hail, Caesar! shows us just how that worked. Eddie Mannix (Josh Brolin) is the go-to guy, the fixer, at Capitol Studios where director Laurence Laurentz (Ralph Fiennes) is filming a ludicrous costume drama starring Baird Whitlock (George Clooney) as Caesar. The paper thin plot introduces us to a gaggle of disaffected Communist screenwriters who kidnap movie star Whitlock as ransom for better pay for their under-appreciated efforts. It implies but fails to explain the roots of the episode in the HUAC hearings of the just pre-McCarthy era. The film opens with a genuinely funny scene of director Laurentz trying to extract just one simple sentence from Hobie Doyle (Alden Ehrenreich), a delightfully inept young cowboy, for a scene in a piece of history he has never heard of. After that we get a good send-up of Esther Williams’ water ballets of the late ‘40s with mermaid Scarlett Johansson diving from on high into the perfection of a circle of programmed swimmers. When she comes up for air, her Brooklyn accent makes comic mockery of the grace of the ballet. She’s terrific. 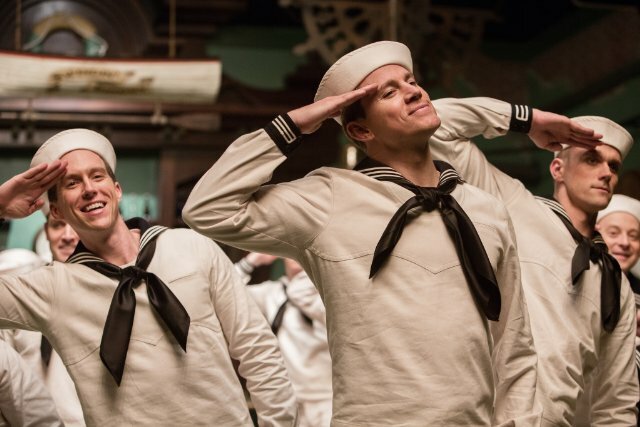 And then, that essence of the era: a gang of sailors led by Burt Gurney (Channing Tatum) in a singing/tap dancing routine that is both effective and completely irrelevant to the movie in which it will appear. That’s what these staples were all about in the late ‘40s and early ‘50s. They were distractions for some, unwelcome interruptions for others. Josh Brolin’s Mannix is quite dull as he snuffs out any brush fires that might slow progress on the set. Watching George Clooney wearing a skirt and silly expressions for 90 some minutes adds nothing. Except for the old fashioned quality of the comic interludes, the movie itself isn’t much fun. When I asked myself who I cared about in this movie, the answer was clear: no one except that sweet young cowboy who couldn’t rise from his own ineptitude. Now it’s your turn. If you decide to go, you might try to think of the movie as the Coen brother’s affectionate smile at Hollywood’s Golden Age. This review was posted on February 14, 2016, in Comedy, Mystery/Suspense. Bookmark the permalink.